One of the hardest parts of getting involved with cryptocurrency is “on-ramping” – finding somewhere to buy crypto in exchange for fiat (normal) money. Despite Bitcoin and blockchain moving into the mainstream and attracting even established financial institutions, finding an exchange that will convert your dollars to crypto is still frustratingly difficult. Here are seven of the best sites for buying cryptocurrencies with fiat. Coinbase is one of the best-known fiat-to-crypto platforms in the world. Based in San Francisco, it’s also one of the most heavily regulated. 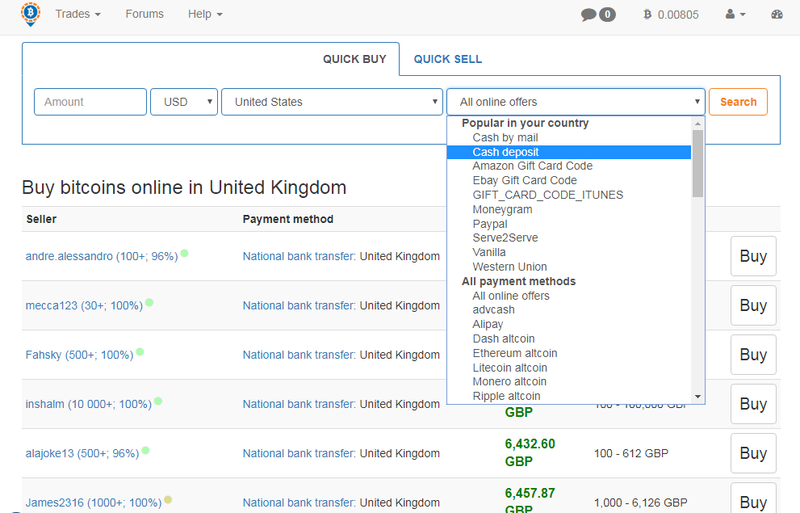 You can deposit fiat to Coinbase from over 30 countries worldwide, making it the site with the widest regulated reach. It’s also one of the few options for people living in New York, where Bitlicense regulations have pushed most crypto-companies to withdraw. 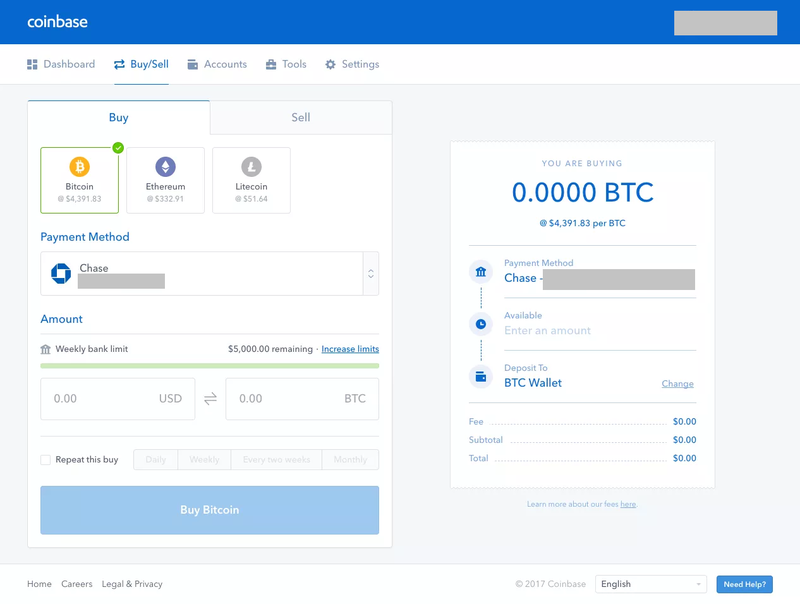 Buying Bitcoin, Litecoin, Ethereum, or Bitcoin Cash is as simple as opening a Coinbase account, linking it to your bank account, and deciding which cryptocurrency to purchase. Transfer speeds depend on your bank: though most are almost instant, some can take a few days to set up and be available. The site also allows you to purchase with debit cards, though not credit cards at this time. Debit card purchases are instant but require photo ID validation in most cases. 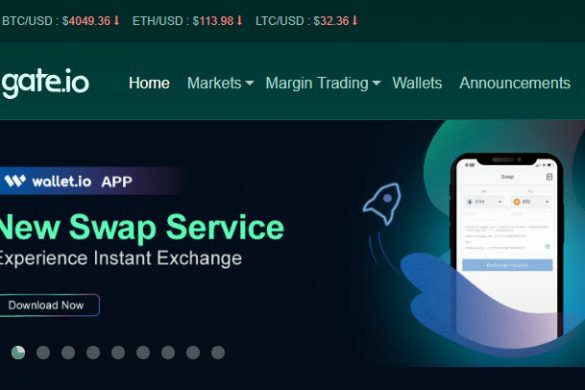 Major investors (in the tens of thousands of dollars) can also wire funds to and from the exchange, provided all the account details match, the money’s wired from a US bank, and you FedWire your funds (don’t use ACH). The biggest downside of Coinbase is its fees: buying cryptocurrency with fiat attracts a 1.49% fee if you use a connected bank account, or a 3.99% fee for debit card transactions. Moving even further away from government regulation, LocalBitcoins – based in Finland – offers peer-to-peer, in-person or online fiat-to-crypto listings. Rather than a centralized exchange, the site offers classifieds-style buy and sell listings for a multitude of cryptocurrencies. The site was originally built to facilitate real-world meetings between privacy-conscious crypto fans, enabling them to trade in person. Over time, it’s grown to include online banking options, on-site escrow, and reputation feedback. Rather than depositing fiat funds to buy cryptocurrencies, you find a seller and arrange to pay them in one of a huge variety of ways. You can transfer funds from your bank, deposit cash at the seller’s bank, use PayPal or Western Union, pay in gift certificates, send a Moneygram, or even send cash through the mail. 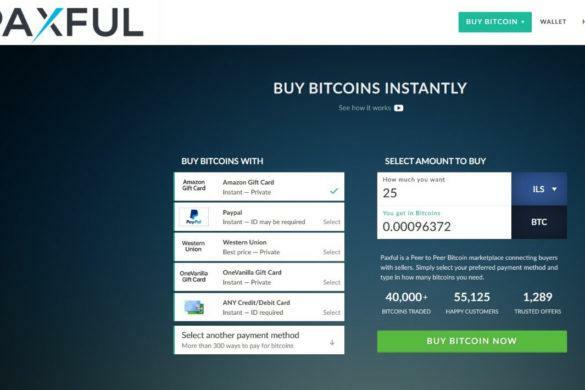 The site charges no transaction fees, but takes around $0.50 for Bitcoin withdrawals. The obvious downside of LocalBitcoins is the complete lack of regulation. You are entirely responsible for keeping records, reporting your purchases and sales, and following both national and state regulations. GDAX is Coinbase’s trading exchange. The fiat-to-crypto and crypto-trading platforms are kept separate, though you can transfer assets from your Coinbase wallet to GDAX instantly. GDAX also allows you to transfer fiat directly from your bank or by wire transfer. And here’s a useful trick. 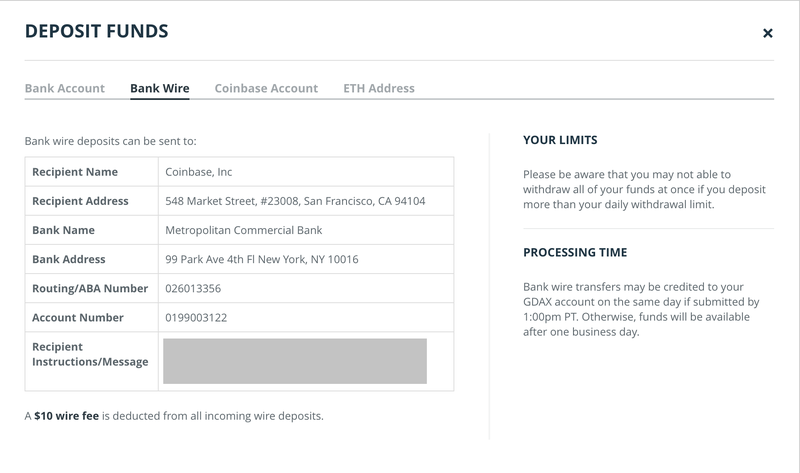 Unlike Coinbase, GDAX charges a fixed fee of $10 for wire transfers, and zero fees on ACH deposits. Depending on how much money you’re moving, you may be able to deposit your funds into GDAX much cheaper. On top of that, “maker” market fees on GDAX are zero. Makers are people who place limit orders on the exchange; takers are those who buy or sell in response. So if you deposit your fiat funds then place a limit order (not a market price order) to buy cryptocurrency at a set price, you’re a maker. As soon as someone agrees to your price, you get your crypto and pay no transaction fee. 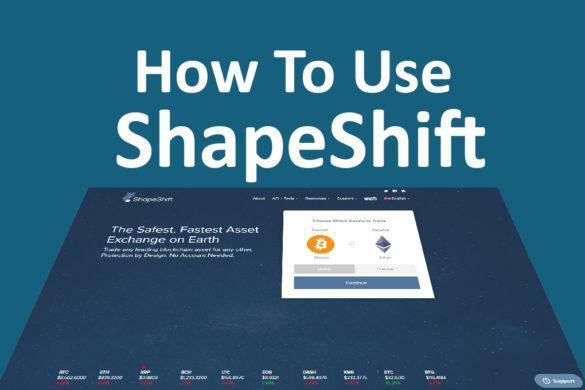 There are no withdrawal fees for crypto assets, either, so you may save yourself a significant sum with a little care and attention! 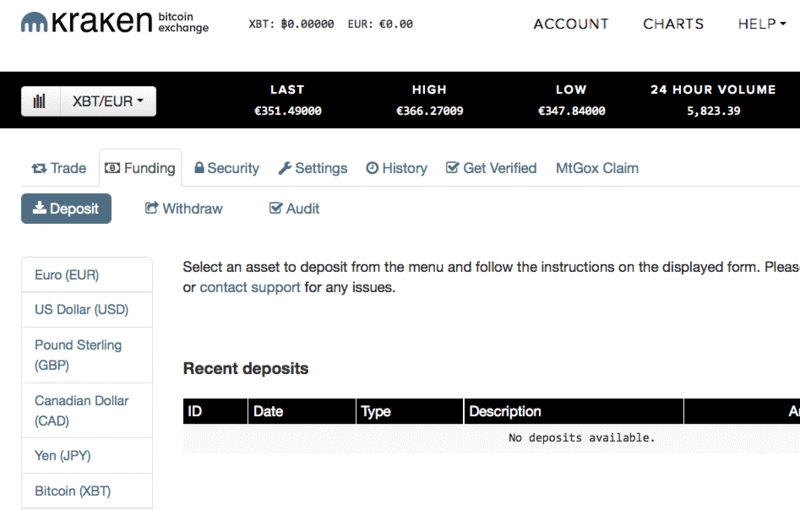 Second only to Coinbase for popularity is Bitstamp, based in Luxembourg. Bitstamp started in 2011 as a competitor to the now-defunct MtGox, so it has a long history of reliability. Also fully regulated, Bitstamp does business in all 28 EU member states and most other countries worldwide. US users are welcome, provided you verify your identity with photo ID and proof of residence (a utility bill, for example). Bitstamp complies with the Foreign Account Tax Compliance Act (FATCA), reporting crypto assets to the IRS for taxation. Bitstamp deals in Bitcoin, Litecoin, Ethereum, and Ripple, all of which can be bought with either US dollars or Euros. You can purchase by depositing funds from your bank (by wire or SEPA transfer) or via a registered debit card. Bitstamp also works with AstroPay to offer deposits from countries otherwise unable to participate. Bitstamp still accepts credit card payments, though you should check with your provider first: some add extra charges for what they consider risky crypto purchases. 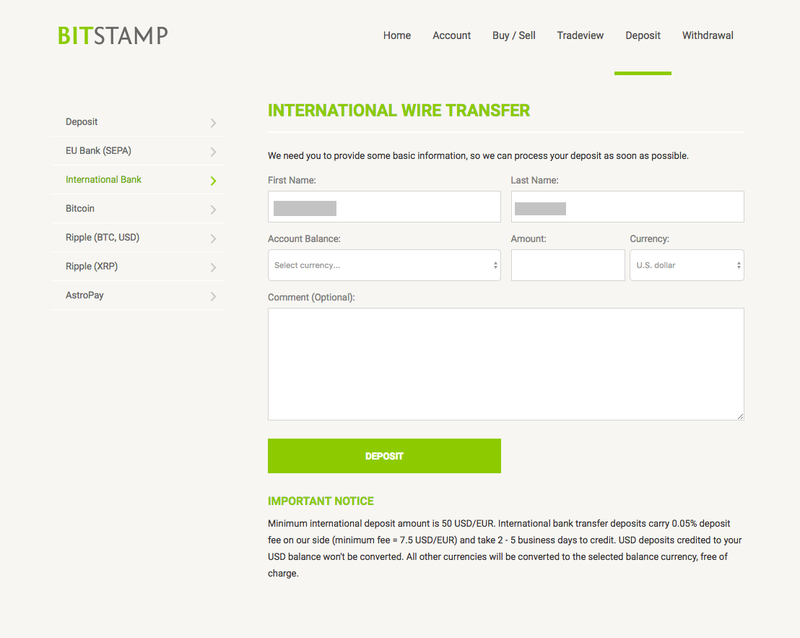 Bitstamp’s fees are gentler for bank deposits – a mere 0.05% on their side for international (US) wire transfers. However, they’ll hit you with a 5% fee on credit card purchases. Unlike Coinbase, Bitstamp will also withdraw to your debit card, though the fee schedule is complex. Kraken is less popular than Coinbase and Bitstamp, but wields great authority in the crypto space. The site provides Bitcoin pricing data to Bloomberg, is a founding member of the Committee for the Establishment of the Digital Asset Transfer Authority (DATA), and participates in many coin reviews, security assessments, and crypto partnerships with banks, payment providers, and industry leaders. Kraken deals in Bitcoin, Litecoin, Ethereum, Bitcoin Cash, Ethereum Classic, Dash, Gnosis, Iconomi, Melon, Monero, Augur, Ripple, Zcash, and Stellar. The exchange operates worldwide and accepts deposits in US dollars, Canadian dollars, Euros, and Japanese Yen. US users can deposit only via bank wire, at a fixed charge of $5 per deposit. You’ll have to verify your account to activate fiat deposits: you need at least a “Tier 3” account, requiring your name, date of birth, country, address verification, and phone number to deposit up to $2,000. Raising that limit to $25,000 requires an additional government-issued ID card, verified proof of residence, your Social Security number, and a selfie of you holding the ID you used for verification. Kraken is one of the most secure exchanges in the world: it’s never been hacked, despite spending most of 2017 under an almost constant assault of distributed denial of service (DDoS) attacks. Gemini is the new kid on the block. Started in 2015 specifically to make buying (and storing) Bitcoin easier and safer, it’s a New York trust company, regulated by the New York State Department of Financial Services (NYSDFS). It’s quickly gained authority, being one of the few exchanges trusted by the BlockTower Capital hedge fund. Gemini deals in Bitcoin and Ethereum. The exchange operates in a growing number of countries, limited only by identity verification requirements. The site’s one of the strictest on regulation: you can’t even register without completing their identify verification process. You can deposit US dollars by bank or wire transfer. 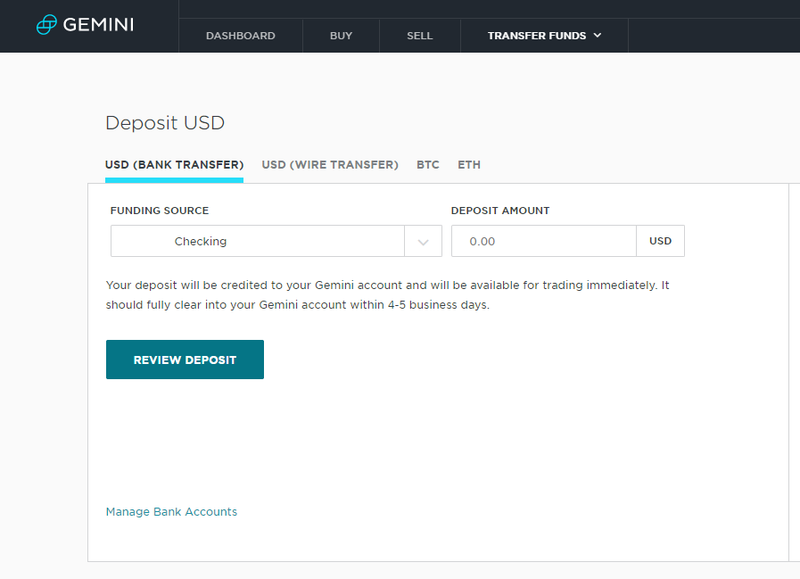 Unlike most other exchanges, Gemini offers multi-user accounts, multiple bank accounts, and instant ACH deposits. 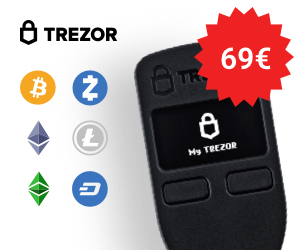 The site charges no fees on incoming fiat. 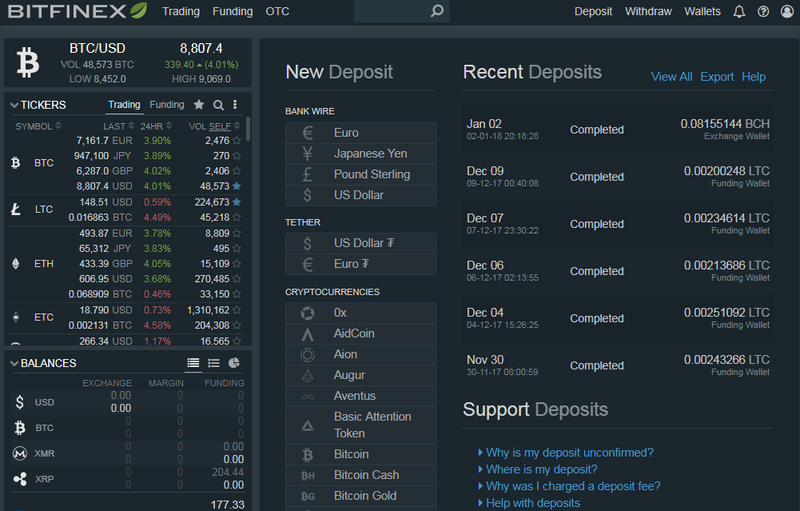 Despite limited options, Gemini offers customer-focused features that most other exchanges have so far ignored. Bitfinex is one of the most advanced (and pretty) crypto-exchanges in the world, but you’ll probably recognize the name from all the negative press. The company has run into a slew of regulatory issues in the US and worldwide because of its in-house coin, Tether, and because of its staunch resistance to regulation that compromises user privacy. Bitfinex offers a growing number of crypto assets including Bitcoin, Litecoin, Ethereum (and Classic), Ripple, Bitcoin Cash, Bitcoin Gold, Monero, Zcash, OmiseGo, and dozens of others, including ERC-20 tokens on the ETH blockchain. The exchange accepts fiat deposits in US dollars, Euros, Pounds Sterling, and Japanese Yen. US users can deposit funds only by bank wire. Bitfinex has a minimum trading stake of $1,000 for new users: you must have $1,000 in liquidity (fiat or crypto) before you can start trading, though it’s fine to fall below that amount once you’re active. Although you can trade anonymously, you must verify your account to activate fiat transfers. Bitfinex requires your name, telephone number, two forms of government photo ID, a bank statement, and proof of address. The site charges a 0.1% fee (minimum $20) on all fiat deposits. Despite the negative press, Bitfinex continues to be reliable and responsible. It’s a great choice for users who dislike the increasing government regulation of crypto exchanges. Which is the best for you? That depends on what you want. Fiat-to-crypto conversion puts you right in the heart of constantly changing regulation (and legislation) in the crypto space. If you prefer to play safe and follow the rules, choose a regulated exchange with the lowest fees for your situation; if you’re more concerned about your privacy and freedom, LocalBitcoins may be your best bet.